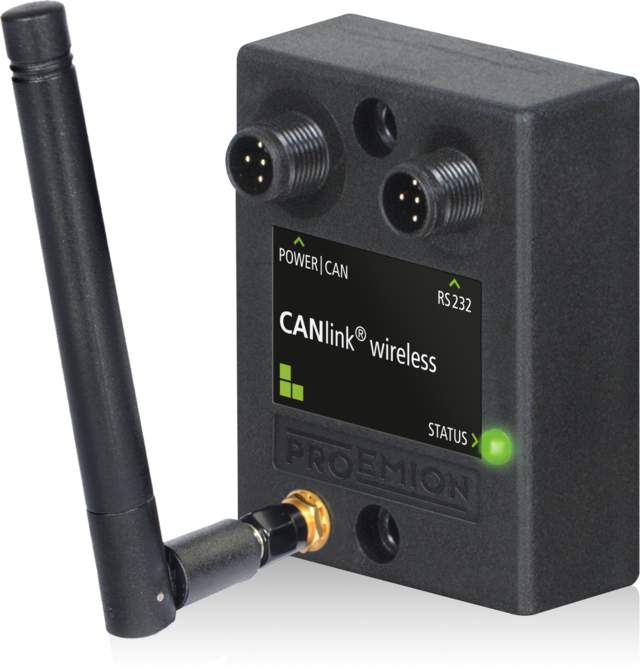 CANlink® wireless is a multi-functional interface for various applications. Even hard to link networks can be connected easily, simplifying handling and saving costs. With CANlink® wireless it is possible to connect mobile units and avoid cable wear, while maintaining a secure connection. Machines with a mobile unit connected via cable carrier or sliding contact benefit of the wireless connections, whenever their CAN networks are difficult to couple. As a result, wear on the cable is avoided, a stable connection is guaranteed and savings are made. The module can be used between different CAN networks or between CAN and Wi-Fi networks; it also can communicate via Bluetooth networks. Wifi data is transferred in accordance with the IEEE 802.11 a/b/g/n standard. Either TCP or UDP data for Wifi protocols are available. A direct connection via Bluetooth can be realized using the Serial Port Profile (SPP). A direct connection via Bluetooth to a computer or laptop using an integrated Bluetooth interface or a second CANlink® wireless device can be realized using the Serial Port Profile (SPP). In this way, CANlink® wireless can also be used as a CAN diagnosis interface. With CAN bus, it is as if the user were directly connected to a mobile or staionary object. CANlink® wireless facilitates a high data transfer rate in order to display CAN data in real time. With the configuration software PEtools the data can be displayed individually on a computer, laptop, smartphone or tablet. By using an appropriate router, CAN data can be transferred via internet or made available over the network. CANlink® wireless has different operating modes. When in infrastructure mode, data is transferred via a Wifi access point, which is often part of the company's internal IT infrastructure. The 3000 series is a low-cost variant in a compact casing for easy assembly. It is particularly suitable for OEM applications with large quantities at a low price. The wireless data transmission has a range of approximately 450 meters (1470 feet). The robust interfaces (IP65/IP67) are suited for rough industrial and agricultural environments with mobile machinery, construction and agricultural machinery and forestry equipment. Likewise they work reliably in the transportation, logistics and in municipal area, as neither cold, heat, moisture, dirt, dust, shock or strong vibration affects their functionality. Even in the mining area, where vehicles are exposed to extreme loads, the CANlink wireless offers a high reliability.